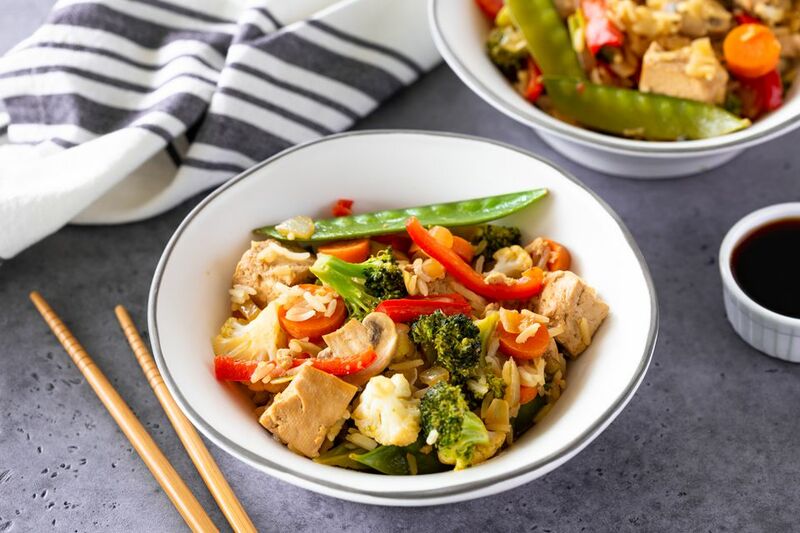 Enjoy an easy Chinese-style vegetarian and vegan vegetable stir-fry with tofu made in a light and delicious ginger sauce. It's a one-dish meal that includes pre-cooked rice. If you have leftover rice, it is a great way to use it up. But if you don't, cooking the rice can be done while pressing and marinating the tofu. Feel free to add in whatever vegetables you happen to have on hand as just about any kind of veggie will work. This stir-fry is a great way to use up whatever you have in your refrigerator or pantry. Don't be shy about using leaf vegetables such as spinach or kale, although you will want to add those to the stir-fry later than the firmer vegetables. You could also omit the tofu, or use seitan or tempeh instead. First, prepare your tofu. Like most vegan tofu recipes, this one will taste best if you press the tofu first. Place the tofu between two paper towels or clean dishcloths and set a heavy bowl on top for 30 minutes. Once the tofu is pressed, cut it into 1-inch cubes. In a large shallow bowl, whisk together the soy sauce, lemon juice, and ginger. Marinade the tofu in this sauce for at least 1 hour. If you need to cook the rice, do so at this point. In a wok or a large skillet, add the oil and cook the cauliflower, broccoli, carrots, onion, bell pepper, and tofu over high heat, stirring frequently. Add the snow peas, mushrooms, green onions, and marinade from the tofu. Allow to cook for just a few more minutes. The vegetables should be tender but not soft. Leftover stir-fry should be refrigerated in a covered container. You can simply microwave it to reheat it and enjoy the next day for lunch or dinner. If you will frequently be cooking with tofu, you can save time by pressing, cutting, and freezing cubes or slices of tofu. When frozen, tofu will be firmer and will soak up more sauce when you use it in a stir-fry or other dish. First, press the tofu for 30 minutes to remove excess water. Slice or cube the tofu and lay the pieces in a single layer on a baking sheet and place the sheet in the freezer overnight. Once frozen, transfer them to a zip-lock freezer bag. Label the bags with the date and contents and use them within a month.